The Waltons is an American television series created by Earl Hamner Jr., based on his book Spencer's Mountain and a 1963 film of the same name, about a family in rural Virginia during the Great Depression and World War II. The television movie The Homecoming: A Christmas Story was broadcast on December 19, 1971. Based on its success, the CBS television network ordered one season of episodes based on the same characters and that became the television series The Waltons. Beginning in September 1972, the series subsequently aired on CBS for nine seasons. After the series was canceled by CBS in 1981, NBC aired three television movie sequels in 1982, with three more in the 1990s on CBS. 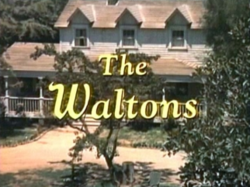 The Waltons was produced by Lorimar Productions and distributed by Warner Bros. Domestic Television Distribution in syndication. The main story is set in Walton's Mountain, a fictional mountain-area community in fictitious Jefferson County, Virginia. The real place upon which the stories are based is the community of Schuyler in Nelson County, Virginia. The series finale, "The Revel", revolves around a party and the invitation date is given as June 4, 1946. A span of 13 years is therefore covered in nine seasons. There are some chronological inconsistencies, which ostensibly do not hinder the storyline. The first three reunion movies (A Wedding on Walton's Mountain, Mother's Day on Walton's Mountain, and A Day for Thanks on Walton's Mountain), all produced in 1982, are set in 1947. Of the later reunions, A Walton Thanksgiving Reunion, filmed in 1993, is set in 1963, and revolves around President John F. Kennedy's assassination; A Walton Wedding, made in 1995, is set in 1964; A Walton Easter, filmed in 1997, is set in 1969. The series began relating stories that occurred 38 years in the past and ended with its last reunion show set 28 years in the past. The story is about the family of John Walton Jr. (known as John-Boy): his six siblings, his parents John and Olivia Walton, and the elder John's parents Zebulon "Zeb" and Esther Walton. John-Boy is the oldest of the children (17 years old in the beginning), who becomes a journalist and novelist. Each episode is narrated at the opening and closing by a middle-aged John Jr. (voiced by author Earl Hamner on whom John-Boy is based). John Sr. manages to eke out a living for his family by operating a lumber mill with his sons' help as they grow older. The family income is augmented by some small-scale farming, and John occasionally hunts to put meat on the table. In the simpler days of their country youth, all of the children are rambunctious and curious, but as times grow tough and the Walton youths grow up to deal with them, the children slowly depart from the innocent, carefree days of walking everywhere barefoot while clad in overalls and hand-sewn pinafores, and into the harsh, demanding world of adulthood and responsibility. The family shares hospitality with relatives and strangers as they are able. The small community named after their property is also home to folk of various income levels, ranging from the well-to-do Baldwin sisters, two elderly spinsters who distill moonshine that they call "Papa's recipe"; Ike Godsey, postmaster and owner of the general store with his somewhat snobbish wife Corabeth (a Walton cousin; she calls her husband "Mr. Godsey"); an African-American couple, Verdie and Harley Foster; Maude Gormley, a sassy octogenarian artist who paints on wood; Flossie Brimmer, a friendly though somewhat gossipy widow who runs a nearby boarding house; and Yancy Tucker, a good-hearted handyman with big plans but little motivation. Jefferson County sheriff Ep Bridges, who fought alongside John in World War I, keeps law and order in Walton's Mountain. The entire family (except for John) attends a Baptist church, of which Olivia and Grandma Esther are the most regular attendees. The church that the Hamners actually attended was Schuyler Baptist Church, near the Hamner homeplace and is still in operation. The church has helped host several events honoring Earl Hamner, Jr., including one in 2014. After completing high school, John-Boy attends fictional Boatwright University (based on the University of Richmond) in the fictional nearby town of Westham. He later goes to New York City to work as a journalist. During the series' last few years, Mary Ellen and Ben start their own families; Erin, Jason and John-Boy are married in later television movie sequels. Conversely, the younger children Jim-Bob and Elizabeth, struggle to find and cement true love. Six feature-length movies were made after the series' run; set from 1947 to 1969, they aired between 1982 and 1997. The town of Walton's Mountain was built in the rear area of the main lot at Warner Bros. Studios, bordering the Los Angeles River, but the mountain itself was part of the Hollywood Hills range opposite Warner studios in Burbank, California (the reverse side of which, and slightly to the east, is Mount Lee and the Hollywood Sign. The Waltons' house façade was built in the back of the Warner Brothers lot. After the series concluded, the set was destroyed. For the reunion shows, a replica Waltons' house façade was built on the Here Come the Brides set on the Columbia Ranch studio, now part of the Warner Brothers studios. The Waltons' house is still used as scenery at Warner Brothers. For example, it served as the Dragonfly Inn on The Gilmore Girls. Some sources indicate CBS put the show on its fall 1972 schedule in response to congressional hearings on the quality of television. Backlash from a 1971 decision to purge most rural-oriented shows from the network lineup may have also been a factor. The network gave The Waltons an undesirable timeslot – Thursdays at 8 p.m., opposite two popular programs: The Flip Wilson Show on NBC and The Mod Squad on ABC. "The rumor was that they put it against Flip Wilson and The Mod Squad because they didn't think it would survive. They thought, 'We can just tell Congress America doesn't want to see this'," Kami Cotler, who played Elizabeth Walton, said in a 2012 interview. However, CBS had enough faith in the show to devise a full-page newspaper ad flanked with the show's positive reviews, urging people to watch the show. This ad was attributed to saving The Waltons, causing the ratings to radically increase. Ralph Waite was reluctant to audition for the part of John Walton because he didn't want to be tied to a long-running TV series, but his agent persuaded him by saying, "It will never sell. You do the pilot. You pick up a couple of bucks and then you go back to New York." The series itself earned a Peabody Award for its first season. In 2013, TV Guide ranked The Waltons No. 34 on its list of the 60 Best Series of All Time. In 2017, from March 20 to March 24 INSP network remembered the life of Earl Hamner Jr. (who had died in 2016) by featuring clips of interviews (once per episode) with him about his time involved with The Waltons during the breaks while its syndicated reruns aired from 3-5pm and again at 7pm. German-release DVDs provide German or English soundtrack options, with dubbed German voices, or the original English soundtrack, although episode titles, in German, are not always either literal or precise translations of the original English-language titles. Seasons 1–9 are available via streaming in SD as well as HD through services such as Amazon Video. Lorimar sold the distribution rights of The Waltons to Warner Bros. Television to avoid a lawsuit owing to the similarities between the series and the film Spencer's Mountain, which Warner owned. Warner Bros. acquired Lorimar in 1989, and has continued to syndicate the series ever since. Reruns currently air in the U.S. on INSP, and formerly aired on Hallmark Channel. In Canada, The Waltons airs on Vision TV and BookTelevision. In the UK, the series was broadcast on BBC 1 and BBC 2 during the 1970s/1980s - the first three seasons were broadcast on BBC 2 from February 18, 1974 to May 17, 1976, on Mondays at 20.00 GMT, and seasons 4 and 5 were shown on BBC 1 from September 5, 1976 to August 30, 1977, on Sundays at 16.10 in 1976 and Tuesdays at 19.00 through 1977. After that, seasons 6-9 would be broadcast on BBC 2 again, starting on April 30, 1979 and concluding in April 1983. The three reunion TV movies filmed in 1982 were also shown on BBC 2 from December 21 to December 28, 1983. The show was repeated on Channel 4 in the 1990s. It currently airs on True Entertainment in the UK. ^ "All About The Creator". All About The Waltons. Retrieved 28 October 2017. ^ A significant anachronism occurs in the first season. In the first episode, the Waltons listen to Edgar Bergen and Charlie McCarthy's radio program (in tribute to Bergen, who played Grandpa in the pilot film). However, Bergen's radio show did not begin airing until 1937. ^ "Home - Schuyler Baptist Church, Schuyler, Virginia". Schuyler Baptist Church, Schuyler, Virginia. ^ Brooks, Tim; Marsh, Earle (2007). The Complete Directory to Prime Time Network and Cable TV Shows 1946-Present (Ninth Edition). Ballantine Books. p. 1686-1689. ISBN 978-0-345-49773-4. ^ Crump, William D. (2013). The Christmas encyclopedia (Third edition. ed.). p. 434. ISBN 9780786468270. ^ "The Homecoming-A Christmas Story". ^ a b c King, Susan (2012-09-28). "40th anniversary celebration of 'The Waltons'". Los Angeles Times. Retrieved 2016-04-30. ^ IV, J. Garland Pollard. "Earl Hamner and the CBS Brand | BrandlandUSA". Retrieved 2017-03-12. ^ "The Waltons". peabodyawards.com. Retrieved December 18, 2012. ^ "TV Guide Magazine's 60 Best Series of All Time". 23 December 2013. ^ Lee Rich Interview: Archive of American Television. Retrieved on June 14, 2014. ^ "BBC Two England - 18 February 1974 - BBC Genome". genome.ch.bbc.co.uk. ^ "BBC Two England - 17 May 1976 - BBC Genome". genome.ch.bbc.co.uk. ^ "BBC One London - 5 September 1976 - BBC Genome". genome.ch.bbc.co.uk. ^ "BBC One London - 30 August 1977 - BBC Genome". genome.ch.bbc.co.uk. ^ "BBC Two England - 30 April 1979 - BBC Genome". genome.ch.bbc.co.uk. ^ "BBC Two England - 29 March 1983 - BBC Genome". genome.ch.bbc.co.uk. ^ "BBC Two England - 21 December 1983 - BBC Genome". genome.ch.bbc.co.uk. ^ "BBC Two England - 23 December 1983 - BBC Genome". genome.ch.bbc.co.uk. ^ "BBC Two England - 28 December 1983 - BBC Genome". genome.ch.bbc.co.uk. Conley, Joe (2010). Ike Godsey of Walton's Mountain. Albany: BearManor Media. ISBN 978-1-59393-508-5. McDonough, Mary (2012). Lessons from the Mountain: What I Learned from Erin Walton. Kensington Books. ISBN 978-0758263674.